Nigella sativa is a black cumin (also known as nigella or kalonji). It is an annual flowering plant in the family Ranunculaceae. It is from south and southwest Asia. Nigella sativa can grow to be 20–30 cm (7.9–11.8 in) tall. The black cumin fruit has numerous seeds which are used as spice, sometimes as a replacement for original black cumin Bunium bulbocastanum. These two plants are both called 'black cumin' on account of their seeds. ↑ BSBI List 2007. Botanical Society of Britain and Ireland. 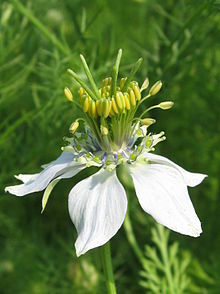 Wikimedia Commons has media related to Nigella sativa. This page was last changed on 9 February 2016, at 08:47.